Meritech, the industry leader in employee hygiene automation solutions, introduces Sole Clean Dry Step, a fully automated footwear sanitizing system for dry and semi-dry production facilities. Integrated with Meritech's CleanTech fully-automated handwashing systems, the Sole Clean Dry Step sanitizes any style of footwear in just 12-seconds. This new footwear hygiene technology features the automated application of a proprietary alcohol-quat chemical blend which sanitizes and then evaporates quickly post application to reduce moisture accumulation around the system. The Sole Clean Dry Step uses D2 EPA registered sanitizer for fast evaporation and can accommodate any style of footwear. 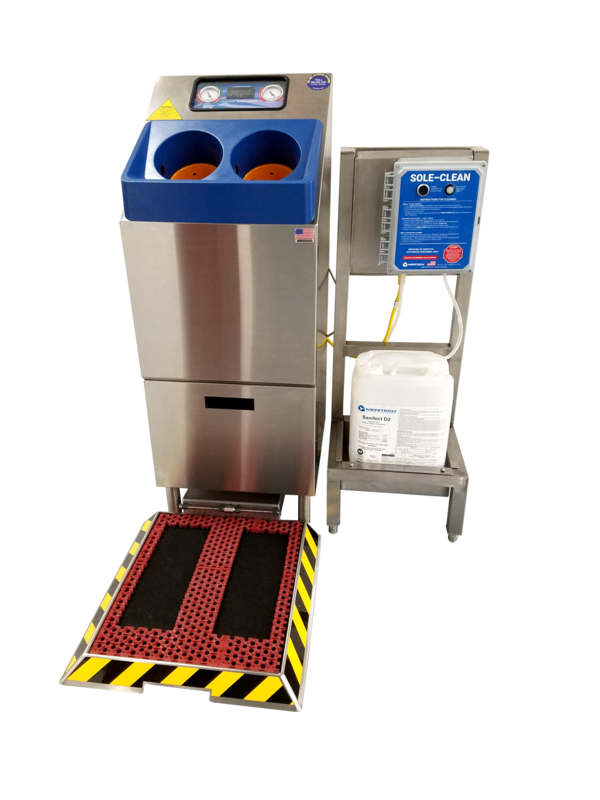 This solution is ideal for use in food production and other dry environments where sanitizing boots or other footwear is equally important as proper hand hygiene, but a "dry" sanitizing system is required. Meritech offers a complete line of NSF certified, fully-automated handwashing, boot scrubbing, and footwear hygiene equipment that provides the only technology-based approach to employee hygiene in the world. Meritech helps companies with their employee hygiene, bioburden control, and infection prevention programs in a wide variety of markets, including food production, pharmaceutical cleanroom, food service and retail, theme parks, and cruise lines. For more information, contact us at 800-932-7707.